Home » Star Diagnosis C3 (Part D) » Star Diagnosis C3 with laptop. Diagnostic system Mercedes Star Diagnosis C3. Ready to operate diagnostic system Star Diagnosis C3 is a set of equipment consisting of a multiplexer Star Diagnosis C3 and laptops (Asus, Lenovo, Dell) installed, configured software Mercedes (Xentry DAS WIS EPC). Diagnostic system Star Diagnosis C3 fully configured and ready to work. Any actions, except connection to the vehicle diagnostic connector that does not require. 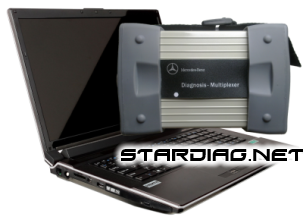 Diagnostic systems such as Star Diagnosis Compact 3 and Mercedes SD Connect Compact 4, including a multiplexer and configured the laptop are in high demand among diagnosticians because of the complexity of the installation process software Mercedes. The user does not have experience setting this can take up to 2 weeks of time learning algorithm installation and search support patches, without which the installation of such programs as the DAS and Xentry not possible. The price of the complete diagnostic system Star Diagnosis C3 depends on the model of the selected laptop and a set of multiplexer (with or without cables). Star Diagnosis C3 multiplexer (scanner) with cable set (5 PCs). A detailed description and cost of the scanner, refer to the post “Mercedes Star Diagnosis C3 dealer scanner Mercedes”. Laptop (Lenovo, Dell) with installed and configured software Mercedes (Xentry DAS WIS EPC). For more details of laptops and prices can be found in the section “Laptops for diagnostics of cars”. USB — COM adaptor on the FTDI chip. Diagnostic software MERCEDS Xentry/DAS is multilingual, however, the old model Mercedes (up to about 2004 V.) diagnosed in the application of HHT included in the DAS. The application of HHT has English or German only. For individual models HHT is only available in German language, in particular beads, vans. The section “information for developers”,the so-called “menu Engineering” has only German language.